Which Teams Best Resemble Past Stanley Cup Champions? 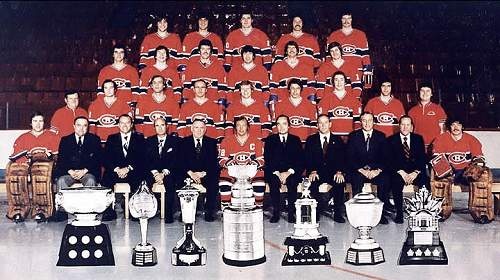 Home/Featured/Which Teams Best Resemble Past Stanley Cup Champions? 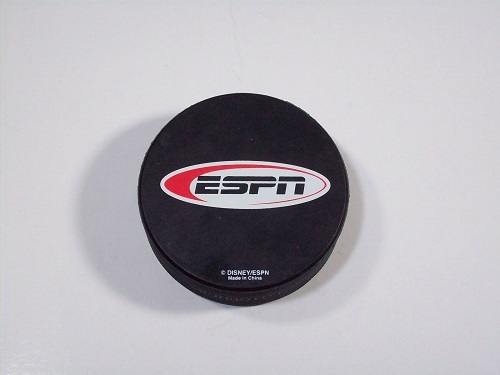 The regular season is now over and it’s time for the greatest sporting spectacle in the world – the NHL playoffs. For 2 months, players will leave it all on the ice, the blood, the sweat, and the tears. It’s the greatest thing in the world. And it’s here now. Can you tell I’m excited? Today, we’ve got an interesting spin on how to “predict” who will win the Stanley Cup. 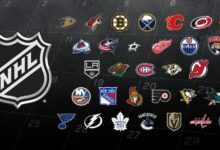 This is our 2nd annual “Stanley Cup Predictor” article, so let’s get started. Goals For (Rank): 3.06 (7th) –> A team scores 3.06 or more goals per game. 1 point will be given for scoring 3.06 goals or more per game and another point will be given for ranking 7th or higher in goals per game. 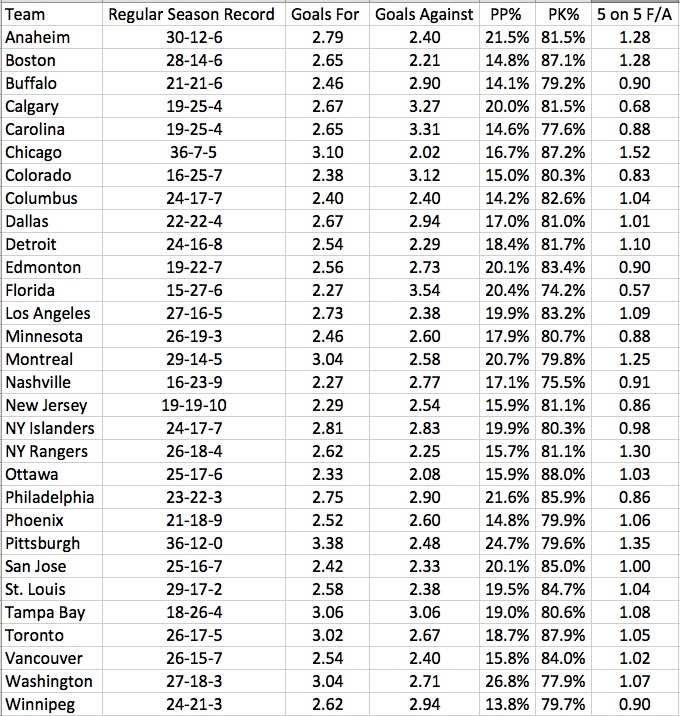 PP% (Rank): 18.1% (13th) –> A team with a PP% of 18.1% or better will earn 0.5 points. 0.5 points will also be given to teams that rank in the top 13 in PP%. PK% (Rank): 84.5% (9th) –> A team with a PK% of 84.5% or better will earn 0.5 points. 0.5 points will also be given to teams that rank in the top 9 in PK%. Even Strength Goals For/Against: 1.24 (6th) –> A team with an Even Strength F/A of 1.24 or higher will earn 2 points. A team that ranks in the top 6 will also earn 2 points. Throughout history, this statistic has proven to be the best indicator of Stanley Cup success. Only 1 team in Stanley Cup history has ever won the Stanley Cup with a ratio of less than 1.00 and that was the Los Angeles Kings from last season. 1st Half Points Percentage: 66.6% –> A team that earned 66.6% of the possible points in the 1st half of the season will earn 1 point. Points Percentage at Home: 70.4% –> A team that earned 70.4% of the possible points at home will earn 1 point. Points Percentage on the Road: 62.0% –> A team that earned 62.0% of the possible points on the road will earn 1 point. 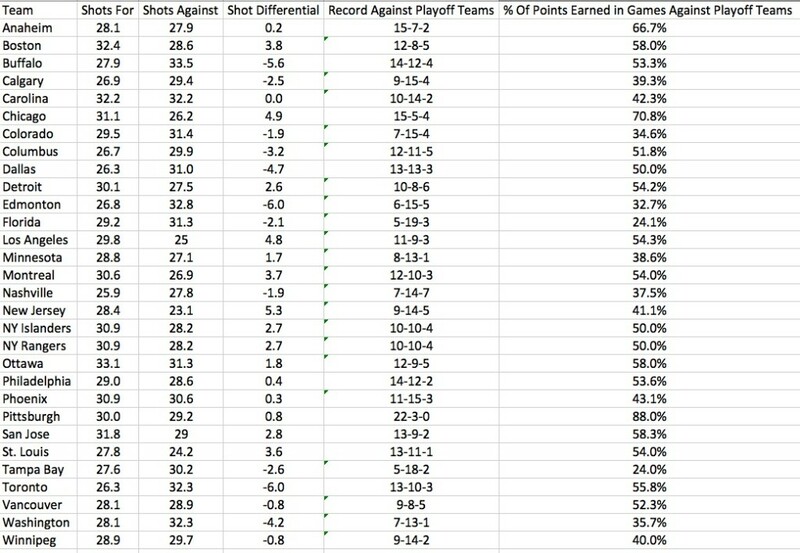 Total Playoff Games Played Previous Season: 12 –> A team that played 12 or more playoff games the previous season will earn 2 points. After reviewing the statistics, 31 of the 44 champions we tracked played in at least 10 playoff games the season before they won the championship. 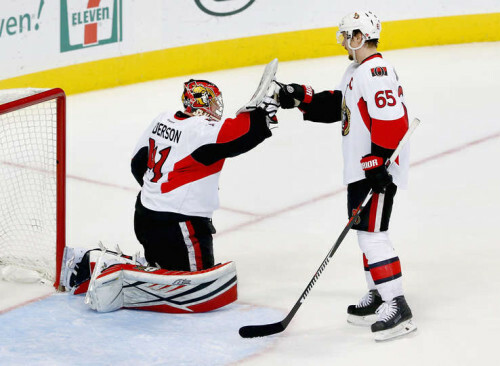 Points Percentage Against Playoff Teams: 63.5% –> A team that earned 63.5% of the possible points against playoff teams during the regular season will earn 2 points. Shots For (Rank): 31.4 (6th) –> A team that averaged 31.4 shots or more will earn 1 point. A team that ranked 6th or better in shots on goal will earn 1 point. Shots Against (Rank): 27.0 (9th) –> A team that averaged 27.0 or fewer shots against per game will earn 1 point. A team that ranked 9th or better in shots against will earn 1 point. 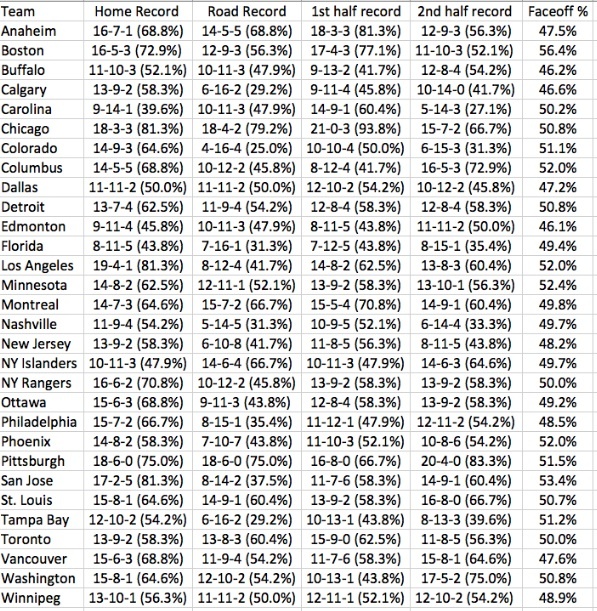 Shot Differential: 4.4 –> A team that had a shot differential of 4.4 or greater will earn 1 point. 1. 39 of the 44 Stanley Cup champions ranked in the top-10 in goals for. 2. 40 of the 44 Stanley Cup champions ranked in the top-10 in goals against. 3. 42 of the 44 Stanley Cup champions ranked in the top-10 in Even Strength For/Against. 4. 35 of the 44. 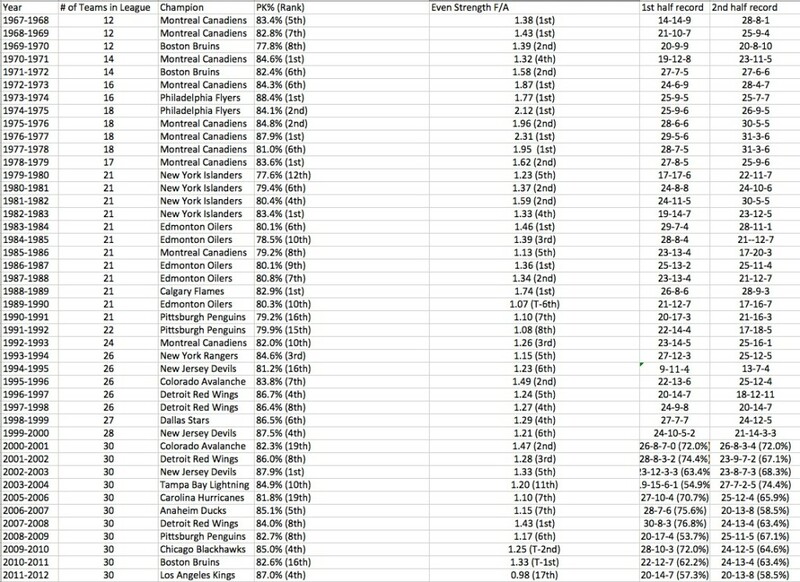 Stanley Cup champions had an Even Strength F/A of 1.20 or greater. 5. 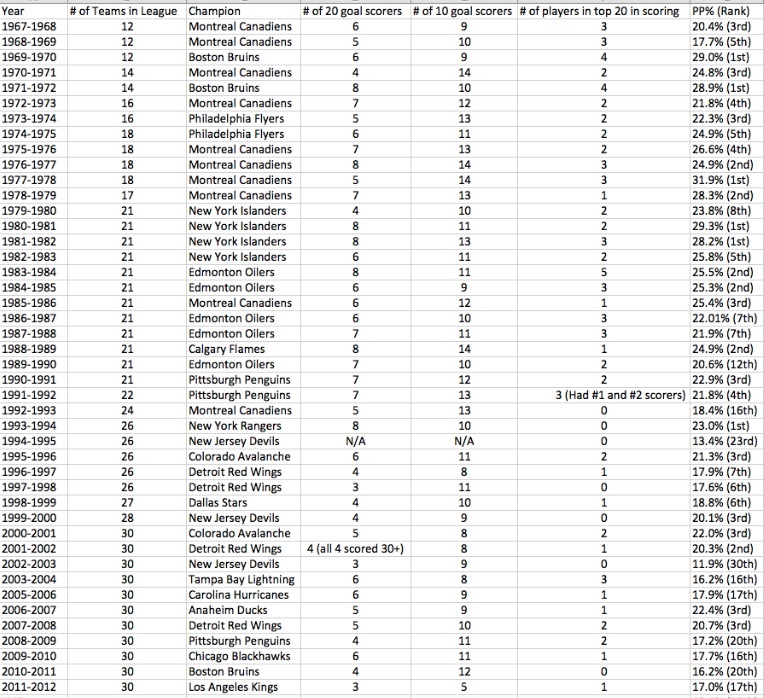 Of the past 11 Stanley Cup champions, only one has earned fewer than 60.0% of the points possible at home, and that was the Los Angeles Kings…who earned 59.8%. 6. Of the past 11 Stanley Cup champions, every single champion has earned at least 58.5% of the possible points in the 2nd half of the season. 8. The 2011-2012 Los Angeles Kings were the youngest team to win the Stanley Cup since the 1989-1990 Edmonton Oilers. 9. Of the past 14 Stanley Cup champions, only 1 has had a negative shot differential (2008-2009 Pittsburgh Penguins). 10. Since 1997-1998, only two teams have won the Stanley Cup without winning at least 50.0% of their faceoffs during the regular season (1999-2000 New Jersey Devils, 2008-2009 Pittsburgh Penguins). 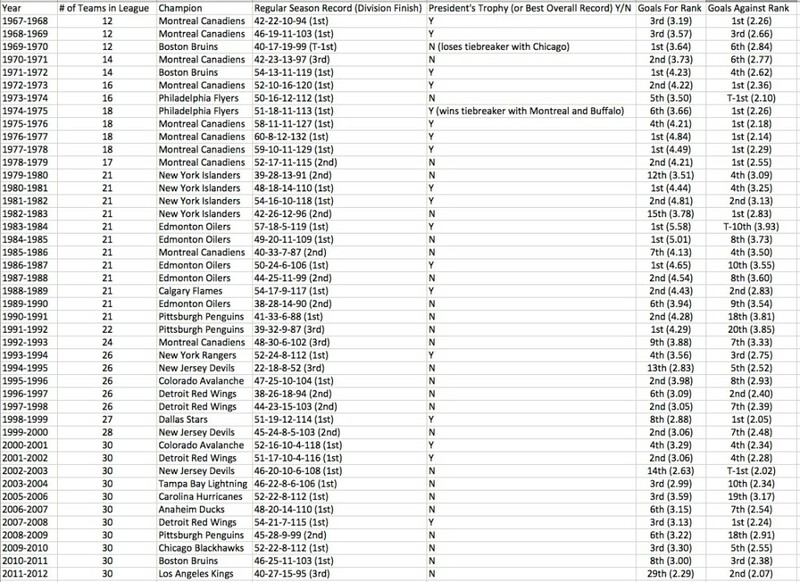 And below is the spreadsheet of this teams from this year. 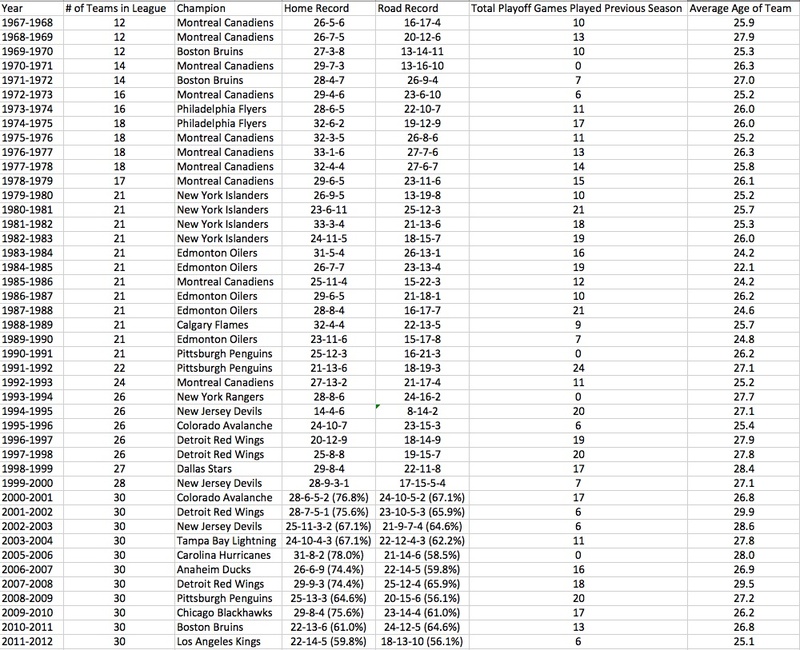 So without further ado, I will rank each of the 16 playoff teams based on the number of points they earned from our metric (Max Score = 25). Ok, so before everybody jumps on me about taking all of this time just to show you that Chicago and Pittsburgh are the two best teams, hear me out. These ratings only indicate which teams best resemble our last 11 Stanley Cup Champions. Below, I’m going to list what each of the past 11 Stanley Cup Champions rated on our metric so you can see what scores our previous champions have had. Now, let’s look at some other statistical trends that apply to almost every Stanley Cup champion as we attempt to narrow down the field. 1. 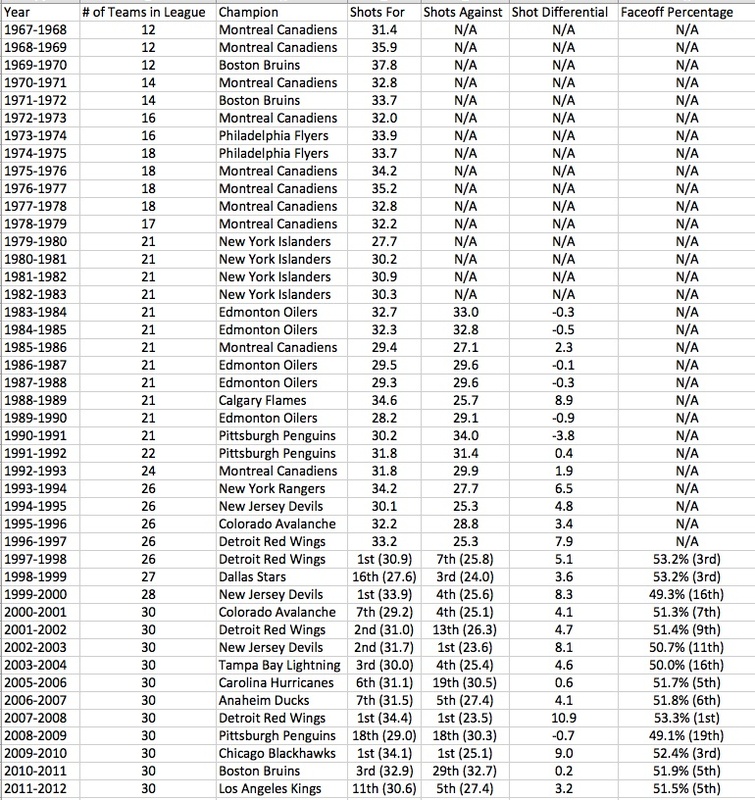 As I mentioned previously, only 1 team in NHL history has ever won a Stanley Cup with an Even Strength F/A of less than 1.07 and that was the Los Angeles Kings. I’m going to say that the likelihood of that happening again is slim to none. Therefore, I will eliminate: Ottawa, St. Louis, and, San Jose. 2. Next, dating back to the 1997-1998 Detroit Red Wings, every Stanley Cup champion earned at least 53.5% of the possible points in games against playoff teams from that season. Therefore, I will eliminate: Washington and the New York Rangers. Ok, we’re down to our final 3 teams from each conference now, with Chicago, Los Angeles, and Anaheim from the West, and Pittsburgh, Montreal, and Boston from the East. Time to get a little pickier with our elimination criteria. 3. Dating back to the 1992-1993 season, every Stanley Cup champion has killed at least 81.2% of the penalties it took. Therefore, I will eliminate: Pittsburgh and Montreal. 4. This one may seem surprising, but since 2000-2001, 10 of the 11 Stanley Cup Champions have won at least 50.0% of their faceoffs. Therefore, I will eliminate: Anaheim. 5. Since 2000-2001, every Stanley Cup champion earned at least 56.1% of the possible points on the road. Therefore, I will eliminate: Los Angeles. So there you have it. 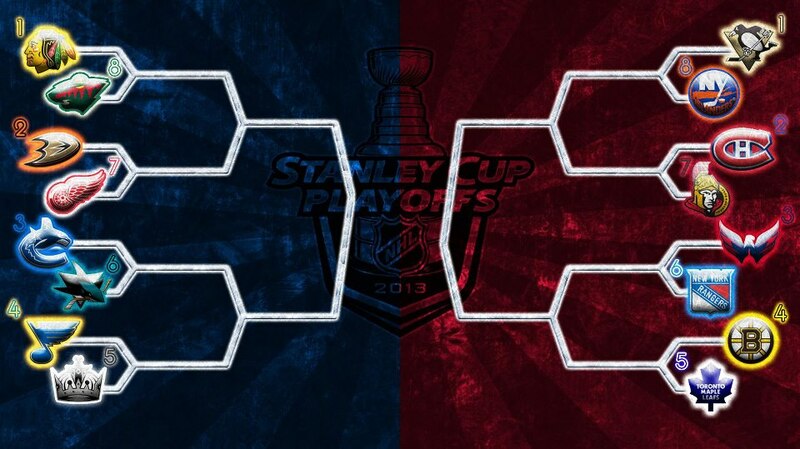 My Stanley Cup battle will consist of Chicago vs. Boston. The Stanley Cup champions from 2010 and 2011 square off. I wouldn’t be surprised to see Boston win this battle, but Chicago has so thoroughly dominated the NHL that it is hard to pick against them. But who knows? 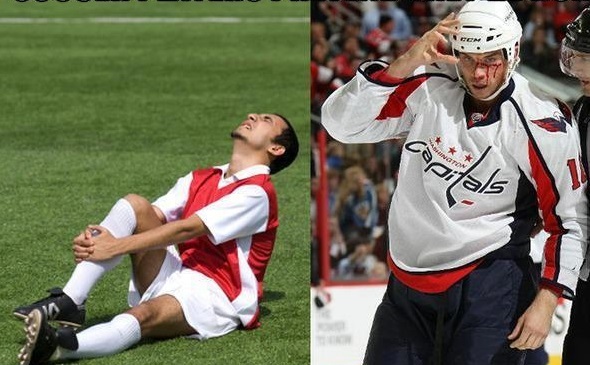 That’s why we love the NHL playoffs. It’s the most unpredictable event in all of sports. We can use all the statistical voodoo we want, but chances are we’ll never find a great way to predict who wins. However, here at Hooked On Hockey, we are more than willing to try. Tune in throughout the playoffs as we collect more data and offer more predictions! Gonna do this article for this year?